Visions of an Alpine Touring binding from a heavyweight Alpine manufacturer like Marker have been dancing in the dreams of A/T skiers for many years now—mine included. Those dreams seemed to come true with the 2008 release of Marker's touring-capable Duke, but spontaneous performances of the Hallelujah Chorus proved a little premature: at nearly six pounds per pair, the Duke's weight placed it at the extreme edge of the touring spectrum—arguably beyond. This year, however, at long last we have an authentic touring choice from Marker, in the form of the Tour F10 and F12 bindings. The only ones not celebrating now are Fritschi. Both Tour F10 and F12 use the same basic design as the Marker Duke, but at a significantly lower weight. The Tour F12 in size small (265-325mm boot) with 110mm ski brakes weighs in at a Fritschi-competitive 4.49 pounds per pair. Without brakes, Marker claims 3.86lbs (1750 grams). As with the Duke, you must snap out of the Tour when changing either to or from touring mode. In most situations, that probably isn't too much of an inconvenience, especially if you typically remove your skis when you put on or take off your climbing skins. The Tour has a release lever in the center of the binding which you push and/or pull to change modes. Note that the position of the lever precludes the possibility of unwanted mode change while skiing. From Alpine mode, pulling the lever causes the binding plate to shift about 40mm rearward, releasing the heel to enter Touring mode. Marker claims this 40mm shift puts the ski in a more comfortable position for walking, and a more effective position for ascending and performing kick turns; However, it's really just a consequence of the binding's design. Much more significant regarding touring comfort is the position of the toe pivot, which is about a full inch farther forward than my Fritschi Explore's pivot. Is that inch noticeable? You bet. I haven't climbed enough with the Tour to make a final pronouncement, but my initial reaction while gliding around is that the pivot point results in a significantly less comfortable stride. That said, as far as I'm aware, we've just covered every possible way in which the Tour might be considered inferior to a Fritschi step-in. To recap: you must step out of the binding to change modes, and pivot position is less ergonometric. 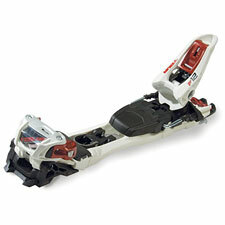 Put your ski on the floor and snap your boot into the Marker Tour F12 binding. Listen to that deep, solid thunk as the binding snaps closed. Now grab the toe of your ski boot and wiggle it—or, I should say, try to wiggle it. In terms of release quality and retention rigidity, the Tour F12 is essentially indistinguishable from a good Alpine binding. Utterly absent is the wiggle/slop/play of my Fritschi Explores. If you want to drive big skis with big boots and never feel your edges skitter in and out due to toe slop, the Tour is indeed a dream come true. And hold on Dynafit riders: you may enjoy a similarly rigid binding interface (I say may), but I ask you, does your binding's release and retention mechanism really have your fullest confidence? Looking at the Tour compared to my standard Marker Griffin bindings, I see nothing to indicate that the Tour in any way offers less release safety. So I'm just going to say it: if you want a true touring binding that you can ride with 100% confidence inbounds and out, this is it. Save one and a quarter ounces if you choose by getting the Tour F10, with a slightly lower 4-10 DIN range. Either way, you're getting extremely close to full Alpine-level performance on the downhill at Fritschi-level weight equivalency on the uphill.